Natiq Jalil is a self-taught artist who believes that true art begins during those moments between being asleep and being awake. Natiq’s work is prized by many private collectors and can be seen in many homes and businesses in the mid-west and throughout the East Coast. His work typically starts out with a doodle, and he works it into the vibrant pieces he is known for. 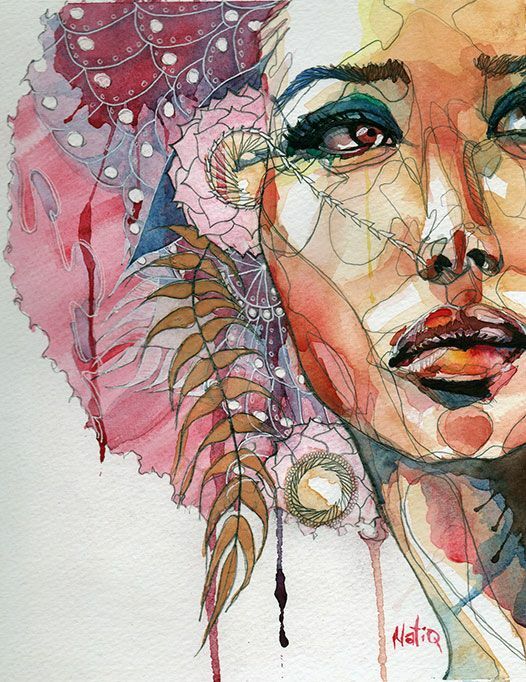 His work is mixed media with a strong focus on watercolor, ink, and acrylic paint. Generally, each piece features a strong female figure (though he paints men, also) as the focus while incorporating various organic shapes, vivid color washes, and beautiful gestural line work. His goal is to bring out the cerebral nature of the content. He has a unique way of elevating the piece's central figures to a spiritual level, pulling the viewer into a sort of meditative experience that is truly incredible. He has experienced success in both gallery settings and underground venues, such as RAW and Touchfaster. He has exhibited work at Luz Gallery in Denver, CO, GPAC, Garfield Artworks, and the Shadow Lounge in Pittsburgh, PA, The Cutting Room in New York City, and many more. He is currently participating in the Double Mirror exhibit at Delanie's Coffee in Pittsburgh, PA. He is currently creating new collections addressing relevant issues such as cultural appropriation, modern social phenomena, and gender roles. Like what you see? Support the artist and purchase a print today. "He has a unique way of elevating the piece's central figures to a spiritual level, pulling the viewer into a sort of meditative experience that is truly incredible." "His work is mixed media with a strong focus on watercolor, ink, and acrylic paint. Generally, each piece features a strong female figure as the focus while incorporating various organic shapes, vivid color washes, and beautiful gestural line work. What really attracted me to the work though, beyond his expertise of the media, was the cerebral nature of the content."